The Red Light Princess takes place in the No Go Zone, a high-density ghetto that has sprung up in the ruins of the old world that lie outside the separation barriers of civilization. The story begins with the narrator, Kai, being chased across the slums of old high-rises, the skywalks above them, up and down and over buildings. Body-modification has developed beyond art to practical usage. Launchers and boosters, talons and weapons fused into muscle and bone allow free-jumps, flight, attack and defense. The ability to sense magnetic fields and metals facilitate tracking for both pursuers and pursuit. Kai’s body modifications are less technologically advanced than those of his pursuers, but he has two advantages: the first is that he’s very good at running away. The second is that it’s the Night of the Clean Hands—a holiday from killing, one night of freedom from the fear of death. Old debts are forgotten on this night, payback is forbidden, and killing is outlawed. Ironically, many people die on this night, both accidentally and on purpose, in the violence of the festival. Still, if anyone breaks the rules and intentionally kills, they are to die in the ring with the Mecha Beasts—cyborg animals who fight, gladiator-style, for the entertainment of viewers. Kai manages to escape his pursuers temporarily, and he witnesses the death of a girl hung from a skywalk. Her murder begins the unfolding of the mythology and the mystery of the Red Light Princess, another girl who died in exactly the same manner as this one, and, as this one, wore a mask, had her hands and tongue cut off, and was covered with tattoos of roses and vines. Something about the original Red Light Princess sparked a devotion and a following—nearly a religion—amongst the people of the No Go Zone, and the imitation of her death has an ominous significance. Because the girl has died in the district of Kai’s gang, he is ordered by his boss to find, before dawn, the person responsible for the death. Tracking the murderer leads him to a brothel where he discovers that the girl is one of three sisters who did a Red Light Princess act. One sister is dead, with two more to go. As Kai continues as both pursuer and pursued, the interconnections between both roles are revealed, along with the reasons for Kai’s personal obsession with the Red Light Princess. Kai is a flawed non-hero who represents an Everyman inside all of us—the disconnected, insecure part of us who has lost touch with all meaning aside from that animal spark inside us that desires life. He is an addict. He has an inferiority complex, constantly comparing himself to a dead brother whom he imitates whenever he wants to hide his own weakness. He wants his luck to change and will enter all sorts of games of chance, all the while knowing he cannot expand beyond his universe of ill luck and mistrust. He has never wanted more than his life here, never wondered what lay beyond the No Go Zone. He’s like a hamster on a wheel and knows it, but hasn’t the lucidity to desire anything different. The disfigured Red Light Princess, her death, and her near deification offers a troubling metaphor, perhaps, for what the masses will cling to when they feel they have nothing else. I didn’t quite understand what she could mean, but that might be because I was too busy trying not to vomit whenever I read descriptions of her. 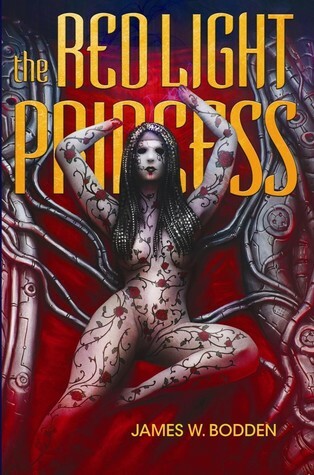 Because yes, The Red Light Princess is highly graphic and often disturbing. It is not a comfortable read. The plot is somewhat dizzying and sometimes got too surreal for me to understand. Still, the writing is effective, powerful, and rarely gets in the way of what it’s expressing. It’s hard to stop reading it even though one knows it’s probably not going to be a happy ending. It’s a story that will challenge its readers, whether they enjoy it or not, and its images will remain in their consciousness long after the read is done.